Pairings are always an experiment. We participate in them each day as we take our meals, presumably with something to drink other than water. Our taste buds assess the mingling flavors. Do they complement or detract? Is it balanced or layered? Do the flavors enhance or overshadow each other? マリアージュ (maria-ju) : a pairing, from the word “marriage” in English. There are many considerations for a pairing, or “marriage” as it’s called in Japan. 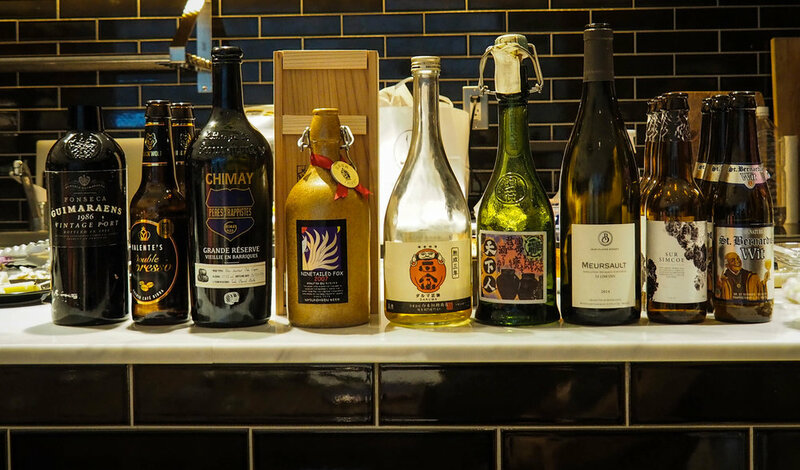 Gentle nuances exist in craft beer, vintage port, wine, and sake that demand a deliberate study. Like cheese, the flavors in alcohol can vary batch to batch, bottle to bottle. Each time a new wheel of cheese is sliced or a cork popped, the flavors in the pairing might blend differently. Thus, it is imperative to listen to our taste buds and do the necessary research. But most importantly, we must enjoy. One lovely Sunday afternoon, a group of eight specialists gathered, each with a different perspective. There was the Beer Sommelier couple, the wine specialist, the journalist, the photographer, the singer, and the cheese person. Our leaders were Masahiro Yamagami of the Japan Drink Association and Fabien Degoulet of Fermier Cheese Shops and winner of the 2015 Mondial du Fromage Competition. The event began with a welcome drink of Kronenbourg 1664 Blanc. Everyone took a seat around the table decorated with traditional cheese molds such as Crottin de Chavignol, Saint Maura de Touraine, and Valençay. On the bar above us, preparations were under way. Bottles were opened, and cheeses were brought to room temperature. We embarked on a journey through nine different pairings on a flavor curve from light and fruity to bitter and rich. Between generous pours and accompanying cheeses, we cleansed our palette with green tea and fresh cut baguette. Over two hours, we drank and ate with careful consideration, taking note of the flavors as they met on our tongues. The pièce de résistance was a vintage port older than myself. The bottle was opened with a traditional tool heated over an open flame and wrapped around the neck of the bottle. It created a clean break below what might’ve been a rotten cork. The afternoon felt particularly experimental then. Before sending us on our way, our hosts showered us with gifts of craft beer, French cheese, and Fermier totes. Our experiment was complete, bellies round with cheese, and heads floating in the sky from a few good drinks. We danced down the hill from Fermier’s Atago shop and scattered onto the streets of Tokyo. Coulomentine is a creation by Fabien. He mixes Japanese dried mikan oranges with Brilliat Savarin and layers it inside a wheel of Coulommiers. The result is a balance of creamy and light flavors with the bright bitterness of orange peels. Coulomentine pairs well with a Belgian Witbier. The smooth fruitiness of the beer balances the creaminess of the cheese. The bitterness in the orange peels is brings out flavors in both the beer and the cheese. It is a fantastic pairing for summer. For me, these flavors were not complementing as much as layering. The complexity of the beer was a little lost on the firm goat cheese round. The bitterness of the hops didn’t bring out the best side of the goat cheese. I would’ve paired the Sour IPA with a tangier goat cheese rather than a Loire Valley style. The cheese was aged wonderfully and the beer was delicious, but the “marriage” wasn’t my favorite. Another pairing that didn’t wow me. I could’ve sipped the chardonnay all afternoon, and Comte is one of my favorites. But this pairing didn’t balance well enough. Comte is a powerfully nutty cheese and it needs a wine that can stand up to it. After introducing a few walnuts to make a triangle tasting, the walnuts acted like a bridge on the tongue between Comte and the chardonnay. This first sake pairing was especially fun. We each picked our own sake cup from an eclectic collection. The sake was gently heated in a traditional bizen bottle. The pairing was surprising and wonderful. 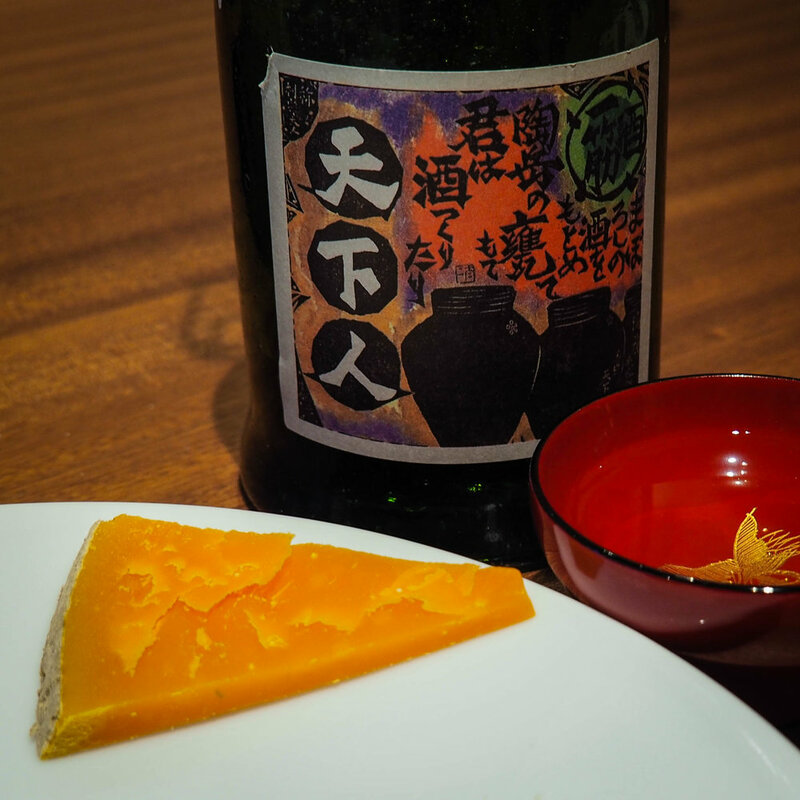 The oily, nuttiness of Mimolette contrasted well with the gentle warmed sake. All the flavors melted on the tongue and made it difficult not to ask for more. With special regard to the cheese, this was a wonderfully aged Epoisses. It had the perfect bulging shape and no hint of ammonia. Served on a spoon, the richness in the Epoisses was balanced by the stickiness of the aged sake. The pairing was truly mouth-filling. The pungency of the cheese never left the nose as the taste buds were covered in sake. This sake would go well with any washed or bloomy rind cheese that tends towards rich and pungent flavors. I was especially excited to taste this beer (which was really barley wine), having had little experience with aged and vintage beers. The beer was gentle, a little sweet, with nuanced flavors that were hard to pinpoint. For me, the bold flavors of the Comte completely overwhelmed the beer. This pairing is an easy one to like. The deep, woody, almost smokiness of the aged Chimay is a fantastic pairing with the blue, creamy, pungency of a slice of Fourme d’Ambert. I'll be coming back to this one in the future. A double espresso beer and dark chocolate simply go well together. When three-somed with a slice of Sbrinz, a lighter, creamier Swiss mountain cheese, all the flavors are heightened. It’s a 3D flavor profile of bitter, sweet, and salty. It is undeniably delicious. My opinion was confirmed by lots of nodding and "yummy noises" around the table. A decanted vintage port is a great balancer to a powerful blue cheese like Stilton. The pairing brings out the fruitiness in the port, mingling mold and grape, with long sour notes on the tongue. The bitterness in both of them was almost cancelled out, leaving creamy and fruity flavors to enjoy.